And now, for the meme! 1. What does feminism mean to you? Does it have to do with the work sphere? The social sphere? How you dress? How you act? It's funny, as I'm the one who came up with these questions for the meme, and I have no idea how to answer any of them! Feminism to me is more a feeling than anything else. I think a woman has the right to feel welcome, safe and equal in a work or social situation. To me, it's all about comfort- feeling comfortable in a variety of different situations, and feeling confident enough to share your ideas and thoughts (politely, of course!). 2. Do you consider yourself a feminist? Why or why not? I don't think I'm actively feminist, but I do believe strongly in making the most I can of the opportunities I am given. I also, though, think that I judge women more harshly than men (I certainly do in literature! ), and I like to think that is because I hold females up to a high standard. But why don't I hold men up to the same standards? Or do I just notice annoying things more in women than men? 3. What do you consider the biggest obstacle women face in the world today? Has that obstacle changed over time, or does it basically remain the same? I think that women are treated more fairly now in many places than they used to be. But I also think their roles have become more complicated. Previously (and I'll stick with the western world for now), women didn't have the right to vote or to keep property or to initiate divorce proceedings. Now, they have the right to do all those things, but they're also expected to play so many roles. Women, more than men, I think, want to do everything. They want to be brilliantly successful in their careers and then pick their kids up from school and cook their husbands three-course meals. If they're not married, they think there's something wrong with them. If they don't want to be a careerwoman, then they think there's something wrong with them. If they don't want to be a mother, they think there's something wrong with them. Really, I think the biggest obstacle women face is their own insecurity. We've come a long way in a short amount of time to being treated as equals from a legal standpoint. But I don't think "society" has caught up to the law yet, and I don't think we as women are comfortable yet with making decisions and prioritizing, which we'll have to do eventually to keep our sanity! Happy birthday to your dad! It's my little sister's birthday today too :). I love your list and your answers. I forgot that I had The Firebrand on my shelves! So many wonderful and exciting books to choose for this challenge - it's only going to be a challenge to keep it to a suffragist eight! I love your answer to the third question. It does seem like women are their own worst enemy. There is this constant perception of not being quite good-enough no matter what role we choose. We are hard on ourselves and we are hard on others. All of which, I agree, stems from insecurity. I would turn it around a bit and not call it "insecurity" but rather suggest that these attitudes are the product of a very focused socialization process perpetrated by men and co-opted women. I am not alleging conspiracy or even conscious intent, but I think both men and co-opted women are parties to the perpetuation of deliterious socialization, usually in the service of financial gain. 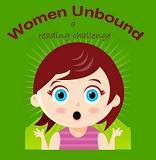 thanks for the response re: the women unbound challenge! i'm a little bummed, but will get over it and find other awesome books to read. glad you like the blog - stop by anytime! What thoughtful answers! I especially agree that women's lives have become a lot more complicated nowadays. There is still a lot ahead of us, a lot has been accomplished but I really as a woman still want to be seen as a woman, totally different from a man and I'm not gonna lie, I like a man to hold a door for me from time to time. Some of the books on your list are ones that I have too, so maybe I will read along with you! I have never really done a challenge before, but there are so many cool challenges out there right now, and I really feel like joining a few. I am going to read a bit more about this one, and see if it fits for me. Thanks for posting this! Oh a full Suffragette! That's commitment. I agree, life is much more complicated than it used to be. I have that Jill Kerr Conway book and have never read it. I'm going to keep changing my list. It would be great to get some books read I already own. I also have a book called Maiden Voyage that I should check out. I think you are a feminist. Many younger women [I feel I can say this b/c I am 10 yrs older than you] think that if they are not "active" in women's causes they are not feminists. It means that you want to be treated the same as a man. To be treated fairly. To be given the same opportunities. Thanks for adding my novel, MISTRESS OF THE SUN, to your list. I think it will give you much to think about with respect to the nature of freedom. Great pile for the Unbound challenge! Happy reading! My Reading List for Women UnBound Challenge. I need to read Graceling for this challenge! Thank you for reminding me! As much as I enjoyed The Stress of Her Regard, the perspective is pretty male, so I thought I'd let you know that it might not fit! I like how your answers led to even more questions. That tends to happen when discussing important and complex things, so don't feel bad for not having the answers! You've got a great list - everyone has great lists for this challenge! I'm looking forward to seeing what you think of all those books. Wow you are a feminist but I think that you don't like the label. Great answers and a great list. And you've brought up some interesting questions too. I do think women are harsher towards other women too. I catch myself doing it sometimes. Maybe it is because we measure ourselves against other women.